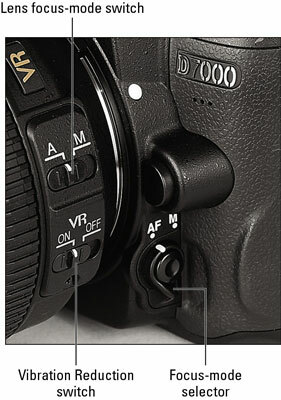 Your Nikon D7000 offers a variety of fully automatic exposure modes on the Mode dial. Your choices include Auto, which is a general purpose, point-and-shoot type of option; Auto Flash Off, which does the same thing as Auto but without flash; and Scene, which gives you access to more than a dozen additional automatic modes that are geared to shooting specific types of pictures. Release mode: This setting determines the number of images that are recorded with each press of the shutter button and the timing of each shot. Focusing: You can enjoy autofocusing, if your lens supports it, or focus manually. On the D7000 kit lens, select the setting via the switch. 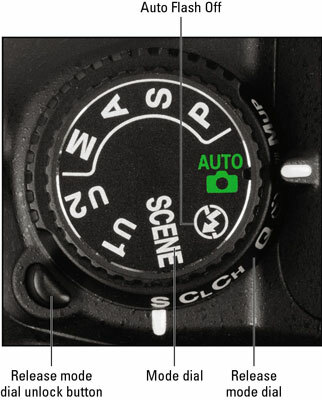 Then also set the Focus-mode selector switch on the camera body to AF for autofocus or M for manual focusing. Vibration Reduction (VR): When enabled, this feature helps produce sharper images by compensating for camera movement that can occur when you handhold the camera. Flash: In Auto exposure mode, the camera automatically raises and fires the built-in flash in dim lighting. But in most cases, you can alter the behavior of the flash through the Flash mode setting. Exposure: You have access to one exposure-adjustment option, ISO Sensitivity, which determines how much light is needed to properly expose the image. You can adjust the setting through the Shooting menu or by pressing the ISO button while rotating the Main command dial. The current setting appears in the displays. Color Space: Stick with the default setting, sRGB, until you are more familiar with it. Long Exposure Noise Reduction and High ISO Noise Reduction: These features try to compensate for image defects that can occur when you use a long exposure time or high ISO setting. If you’re not up to sorting through any of these choices, just leave them all at their default settings. After all, the defaults are chosen because they’re the best solutions for most shooting scenarios.